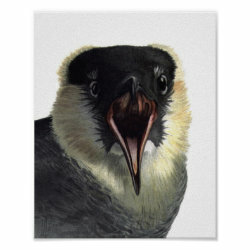 The Pomarine Jaeger, or Pomarine Skua, is a large seabird and the largest bird in its family. From the looks of this dynamic reproduced painting by ornithological artist Louis Agassiz Fuertes, these gull-like birds have a lot of personality. This head-on portrait features the jaeger with an open beak.